What is the Trick-or-Teeth! Project? Trick-or-Teeth! is a Grandma's Gifts project where people of all ages across the WORLD collect toothbrushes, toothpaste and dental floss to be donated to people in need in the Appalachian region of the United States. Grandma’s Gifts volunteers then take the goods collected and assemble packets that contain a toothbrush, toothpaste, and dental floss. What is the purpose of Trick-or-Teeth? 1. Provide dental hygiene goods and dental hygiene education to Appalachian children! 2. Provide education to individuals outside of Appalachia about community service and poverty in Appalachia, as well as give them a chance to make a difference in the lives of people here in the USA! How many years has Grandma’s Gifts organized Trick-or-Teeth!? 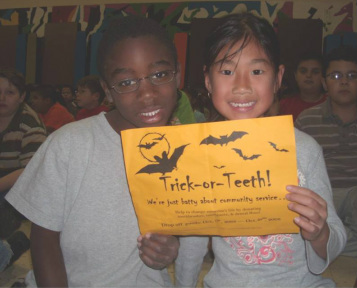 Trick-or-Teeth was started in 2007. How big of a difference has Grandma's Gifts made through Trick-or-Teeth? We are collecting toothbrushes, toothpaste, dental floss, mouthwash, and cash donations to help us purchase the other needed supplies for this project like shipping, printing, tape, and more! Originally we collect goods throughout September and October, now we have groups that collect and donate gods year round! Who will receive the goods collected? Goods will be sent to Appalachian City/County health departments; schools; food pantries; free dental clinics; battered women's shelters; nonprofits that serve the community; and Sheriffs/Officers who are in touch with their community that currently work to distribute goods to people in need. Why has Grandma’s Gifts decided to do Trick-or-Teeth!? While speaking with an Appalachian teacher about Grandma’s Gifts, she shared with us a list of goods that she felt would be most needed by her students. She said, “75% of the children at my school participate in the Federal Free Lunch program. These kids need the basics; coats, shoes, food, and things like toothbrushes.” ----This is where the idea for Trick-or-Teeth! came from. We have always believed that kids who establish healthy habits early in life will carry that behavior into adulthood. After speaking with the teacher, we realized that the need was greater than we could have imagined. How many America’s do you know feel privileged just because they have a toothbrush and dental floss? What will the long-term impact of this project be? According to the Children’s Defense Fund, dental care is the single most common unmet health care need among Appalachian children. Further, according to the US Department of Health and Human Services, 30 of the 32 Ohio Appalachian counties were designated as dental shortage areas, meaning there is only one dentist for a patient population of 5,000. This project will not only makes kids healthier and happier but it is a great way to give them a positive view of healthcare. Being healthy will allow these children to focus on their education, and will hopefully help to lower healthcare costs in the future! Lastly, by involving the community and kids of all ages in the collection they learn about Appalachia, community service, and how they can change someone’s life… one toothbrush at a time! **Source: Martin CA, McNeil DW, Crout RJ, Lawrence SM, Weyant RJ. Orthodontic treatment needs in Appalachian youth and their parents. Poster presentation, 80th General Session of the International Association of Dental Research/American Association of Dental Research, March 2002, San Diego, CA.